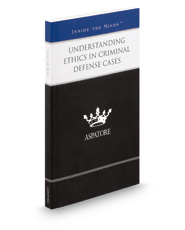 Understanding Ethics in Criminal Defense Cases offers litigators working on criminal defense cases expert advice on how to juggle multiple priorities, gain your client's trust in a highly stressful situation, and uphold yourself as a staunch advocate for the law. Complying with ethical standards whiles defending your clients can oftentimes pose its own challenges. You have obligations to not only do your best work, but to provide your clients with competent, zealous representation. In order to prepare for this, you need to know what major obstacles you and your clients will face. Understanding Ethics for Criminal Defense Cases will help you identify and overcome these obstacles. Written by experienced partners from law firms across the nation, this book gives you in-depth analysis of providing well-researched representation, and practical guidance on how to address appropriate sentences for your clients prior to making your case at court.